Brexit coins and cancelled parties: What is happening on 29 March now? The UK is no longer leaving the EU on 29 March. Brexit day has been postponed - to exactly when remains uncertain. But where does that leave the parties, merchandise and TV specials planned to mark the occasion? The government had promised a commemorative 50p coin to mark the UK's departure from the EU. The original design, announced in October, featured the phrase "peace, prosperity and friendship with all nations", as well as the date of 29 March. No harm done, though, as the Treasury has confirmed that the coins have not yet been minted. The department said a small number of trial coins had been produced, as is standard procedure at the Royal Mint, but this incurs no cost to the taxpayer. And a commemorative 50p will still be produced following the UK's departure from the EU, a spokesman confirmed. Those interested in buying one can register their interest on the Royal Mint website. The Lanark Print Co. has been making and selling Brexit-themed T-shirts for people on both sides of the debate for a while. One of its designs reads "British Independence Day 29.03.2019" - and it is still listed for sale on eBay. Will they be axing that design? No, says company manager John Douglas. "We still sell 1986 World Cup ones," he says, adding that the shop will keep selling the Brexit date ones. And there won't be any of them ending up as reduced-to-clear, as, "we only make them to order, we don't have any on the shelf". Mr Douglas added that there's been a steady stream of orders, although their most popular design has been their "citizen of Europe" slogan, he said. Just under a fortnight ago, a group of pro-Brexit campaigners set off on a 270-mile march from Sunderland to London. Organised by the Leave Means Leave campaign, the marchers are due to end at a rally in Parliament Square on 29 March. But rather than a triumphant arrival to celebrate Brexit day, the group's co-chair, Richard Tice, said the event would now be a protest at the delay. "The message is very much that democracy is dying in this country," he told the BBC. "We should be leaving with no deal on 29 March." Brexit: What could happen next? What preparations are being made for a no-deal? However, a "Big Brexit Bash" organised by the group will also still be going ahead, he said. But instead of a celebration, Mr Tice said the private party would now be "a review of where we are and what needs to be done". 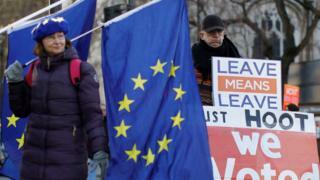 Lucy Harris, director of Leavers of Britain, a network of Brexit-supporters across the country, said it was still important to mark the date the UK was supposed to leave. Ms Harris said she would be joining the Leave Means Leave rally in London on Friday, while local branches of the group are still planning parties in cities across the country. "We always knew there was a very high chance these events wouldn't actually be a celebration," she admitted. "But it's still important to hold them so we can voice our concerns." Landlady Louise Emery was one of those who had planned a party for 29 March at her pub in Doncaster - a town which voted 69% to leave - but has decided to cancel the event. "We're not leaving on Friday so there isn't anything to celebrate anymore," she said. There have also been postponements on the other side of the Brexit debate. Group London Swedes, which is the largest community for Swedes in the UK and which supported remain in the EU referendum, had organised a "tongue-in-cheek" event called the UK's Leaving Drinks. The event on Facebook went viral, with 14,000 people registering interest and another 2,600 saying they would go. The event was later combined with another on Facebook, attracting interest from hundreds of thousands of people. But the event was postponed last week as uncertainty grew in Westminster about when the UK would actually leave. The new date for the event is 31 May. Charlotte Ågren, founder of the group, said: "The postponement of the event was not an easy decision - but we felt a bit strange going ahead with 'leaving drinks' on a date that isn't necessarily close to our actual departure date... or indeed if we're even going to leave at all." She added: "We think it would be more fun to have it on the actual day. "No one wants to be at home alone on that day grieving. We also noticed that the ticket sales didn't really move after the latest news about Brexit being postponed. "This is understandable and it did affect our decision." Other club nights appear to be going ahead. LGBT+ bar The Chateau in Camberwell, south London, is hosting an "I Will Always Love EU" club night on Saturday. Tickets have sold out, and organisers promise the event will be "a safe space of zero political chat and maximum bangers all night long". TV networks have also had to tweak their plans for the UK's exit, which was due to happen at 23:00 GMT. A copy of last week's Radio Times showed that two BBC News specials had been planned - one from 21:30 and another after the News at 10. But a later schedule, on Sky's TV guide, shows that those specials have now been scrapped. EastEnders and the Masterchef final have both been shunted back by half an hour, and a repeat episode of Would I Lie to You also been added to the schedule. And the Friday night film, Sliding Doors, has been brought forward to start an hour earlier - covering the time the UK was initially scheduled to leave the UK. Meanwhile, Channel 4 comedy panel show The Last Leg has a problem of its own. In the last episode, filmed after the Brexit delay had been announced, host Adam Hills told viewers: "It's ruined our plans as well. "We started this series thinking we were counting down to our final episode coinciding with Britain leaving the EU. "We were even finishing at 11pm next week which is the moment Britain was going to leave." The team had come up with an alternative plan for the show - which they called the "backstop" - to instead celebrate model Elle Macpherson's birthday instead. (She turns 55 on Friday). But, as Adam Hills said: "Unfortunately much like Brexit, we didn't check whether we could do this before saying we would. Turns out, Elle Macpherson is not available next week." But the clear winners from the Brexit delay could be those hoping for a holiday soon. The uncertainty over whether the UK would be leaving the EU without a deal had led to fears that there could be travel disruption after 29 March. Emma Coulthurst, from travel comparison site TravelSupermarket, said this meant some people had put off booking holidays soon after that date, meaning there are some last-minute bargains up for grabs in April. She said package holidays to destinations, including Ibiza, Majorca, Portugal and Corfu were "much more affordable" this year and available at prices which were "virtually unheard of" for the school holiday period. Ms Coulthurst said other factors - including renewed competition from destinations like Egypt and Turkey - could also be at play. And while there is no longer a risk of the UK leaving with no deal on 29 March, this could still happen at a later date. Brexit: What would a 'no deal' look like? Brexit: What preparations are being made for a no-deal? Brexit: How will it affect my holidays to Europe? At least 137 people are killed and hundreds hurt in eight blasts in churches and hotels, as a curfew is announced.